Unlike atropine, glycopyrrolate is completely ionized at physiological pH values. 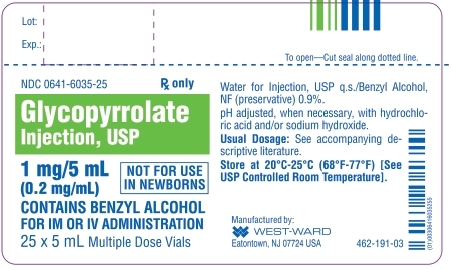 Glycopyrrolate Injection is a clear, colorless, sterile liquid; pH 2.0 – 3.0. The partition coefficient of glycopyrrolate in a n-octanol/water system is 0.304 (log10 P= -1.52) at ambient room temperature (24°C). The mean volume of distribution of glycopyrrolate was estimated to be 0.42±0.22L/kg. 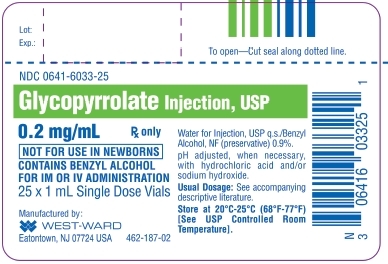 Glycopyrrolate Injection is indicated for use as a preoperative antimuscarinic to reduce salivary, tracheobronchial, and pharyngeal secretions; to reduce the volume and free acidity of gastric secretions; and to block cardiac vagal inhibitory reflexes during induction of anesthesia and intubation. When indicated, Glycopyrrolate Injection may be used intraoperatively to counteract surgically or drug-induced or vagal reflexes associated arrhythmias. Glycopyrrolate protects against the peripheral muscarinic effects (e.g., bradycardia and excessive secretions) of cholinergic agents such as neostigmine and pyridostigmine given to reverse the neuromuscular blockade due to non-depolarizing muscle relaxants. Glycopyrrolate Injection is not recommended for the treatment of peptic ulcer in pediatric patients (see PRECAUTIONS – Pediatric Use). This list does not constitute an endorsement of the clinical utility or safety of co-administration of glycopyrrolate with these drugs. 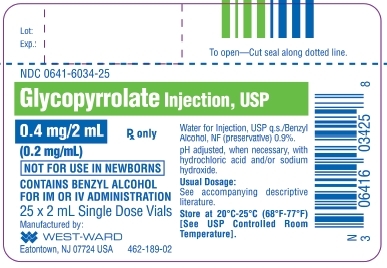 Glycopyrrolate Injection is compatible for mixing and injection with the following injectable dosage forms: atropine sulfate, USP; Antilirium® (physostigmine salicylate); Benadryl® (diphenhydramine HCl); codeine phosphate, USP; Emete-Con® (benz-quinamide HCl); hydromorphone HCl, USP; Inapsine® (droperidol); Levo-Dromoran® (levorphanol tartrate); lidocaine, USP; meperidine HCl, USP; Mestinon® /Regonol® (pyridostigmine bromide); morphine sulfate, USP; Nubain® (nalbuphine HCl); Numorphan® (oxymorphone HCl); procaine HCl, USP; promethazine HCl, USP; Prostigmin® (neostigmine methylsulfate, USP); scopolamine HBr, USP; Stadol® (butorphanol tartrate); Sublimaze® (fentanyl citrate); Tigan® (trimethobenzamide HCl); and Vistaril® (hydroxyzine HCl). Glycopyrrolate Injection may be administered via the tubing of a running infusion of normal saline. 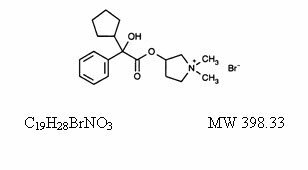 Since the stability of glycopyrrolate is questionable above a pH of 6.0 do not combine Glycopyrrolate Injection in the same syringe with Brevital® (methohexital Na); Chloromycetin® (chloramphenicol Na succinate); Dramamine® (dimenhydrinate); Nembutal® (pentobarbital Na); Pentothal® (thiopental Na); Seconal® (secobarbital Na); sodium bicarbonate (Abbott); Valium® (diazepam); Decadron® (dexamethasone Na phosphate); or Talwin® (pentazocine lactate). These mixtures will result in a pH higher than 6.0 and may result in gas production or precipitation.